What probably should have been bigger news than has been reported is the Consumer Price Index (CPI). It’s fascinating! Really! Just hear me out. The CPI comes out every month from the Bureau of Labor Statistics. It is a short term indicator on how strong or weak the economy is. The Federal Government puts out household surveys around America asking them what they bought in the past month, compares it to last month, and sees which prices rose and which ones fell. Economists need this information to determine the inflation rate, and people on Wall Street need it so they know what areas of the economy to bet on. When the Obama administration enacted a new stimulus package in the form of tax breaks, I wrote a post explaining why stimulative was too strong of a word. The reality was that Americans were going to use the tax breaks on the basic items that they have to pay for like rent/mortgage, health care, and food. Spending is a major part of America’s economy, especially since we are not building as much as we used to. While the tax cuts will help the overall economy because people will be spending money, the important thing is people won’t feel they have to choose between the items they need to live. Last month the CPI rose 0.5 percent, and the three main areas where people put their money was on energy (to heat their homes), food (to put in their stomachs), and health care (so they won’t get the flu). When stock brokers look to make money, they look to invest in areas of the economy they think people will be spending their money. Some of these areas are obvious. As the weather gets colder people are going to heat their homes. Since the employment rate fell more people could afford to buy health insurance, and while people always bought food, the reason why the amount of money people spent on it went up is because the price of food went up. 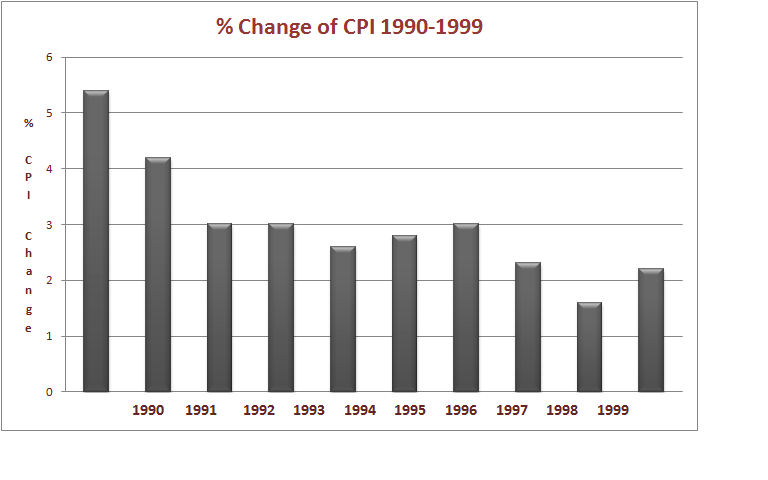 But sometimes it’s not so obvious, and looking at a short history of the CPI you can see why. 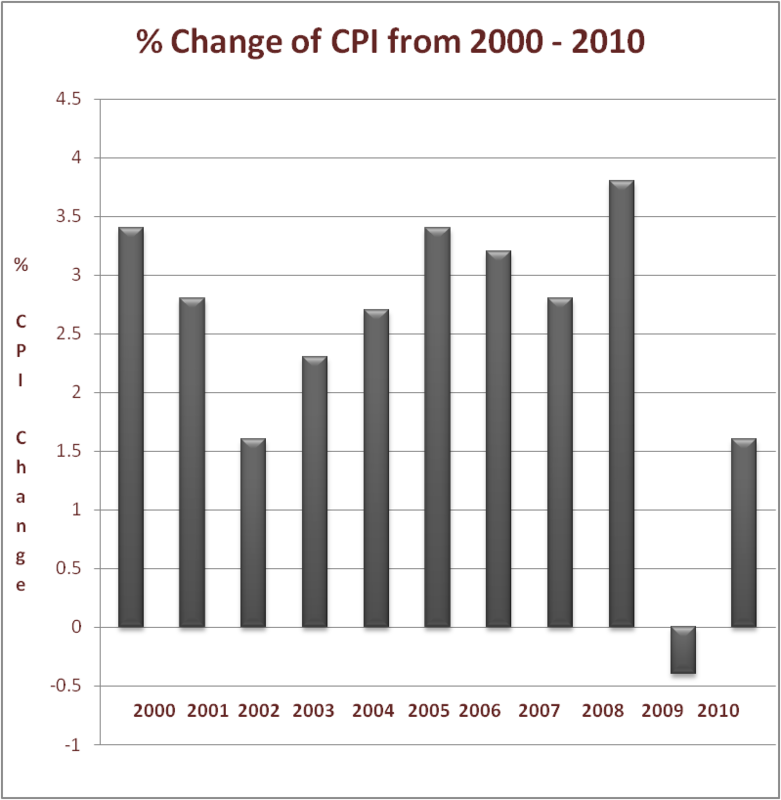 The chart above shows the average change that the CPI occurred every year from 2000-2010. What sticks out to me here is how volatile it is. From 2002 to 2003 there was a full percent increase, and in real monetary terms we are talking about hundreds of millions of dollars. The highest point, probably not coincidentally, was in 2008, before the financial crisis in 2009, where the CPI turned negative. While the CPI isn’t the only analysis Wall Street looks at, it is an important one. The figures they see here are what give them the confidence to bet with people’s money. But as you can see, because the consumer market is so volatile, it is hard to guess which areas of the economy will be earning money. Now people may argue the turn of the century is an unfair time to use because the economy wasn’t strong. So let’s take a look back when America turned to Nirvana, the 90’s. Today, the stock market ended on the highest note in the past two years. That tells me people who look at this data feel confident that the economy is going in the right direction. Otherwise, they wouldn’t be so willing to invest so much money, in any area. Markets went up because they saw overall manufacturing go up, which means there is a high demand for products and more people will be spending money. Now, it’s just matter of figuring out where. What gets me is how some conservatives argue that the better the Wall Street is doing, the better America does. That simply isn’t true. If you are lucky enough to have the money to buy stocks right now, yes, you are doing well. But millions of American’s don’t and are choosing to keep a roof over their families, get their family food, or give them health insurance. Fortunately last month, according to this CPI, most families were able to do all three. The truth is some people are better than others determining which stocks are worth your money. Anyone who tells you they know exactly what will happen in the future is lying. There were people who knew the financial crisis was coming, but even those people couldn’t say when. As the market has been fluctuating since Washington bailed it out, it is important to remember to learn the game before you play, to do your homework and then place your bets carefully.